Bologna opened its city’s doors to host an extraordinarily important trade fair on an international level, involving all those who operate in the leather field: Linea Pelle trade fair took place from October 18th to 20th, and is organized twice a year. It seems obvious to say that we found a huge amount of interesting news and original proposals news regarding collections and color combinations proposed by the many tanneries for next fall-winter season 2012-2013. As was mentioned on the official Linea Pelle website, this event “involves, twice a year, a world wide economic sector, made up of more than 50 thousand companies, 1 million operators and a turnover of about 113 billion dollars”. With more than 1119 exhibitors, of which 763 were Italians and 356 were other nationalities from 41 different countries, and covering an area of 50.000 square-meters, Linea Pelle maintains its established position as the most important event in the leather sector. Among the numerous Italian exhibitors, there were more than 264 tanneries from the Santa Croce district, ,an Italian town renowned for its advanced technology and innovation in leather tanning. The Gleni staff visiting the event paid particular attention to these stands, since the leather that Gleni uses for its creations comes directly from the top tanneries of the Santa Croce district. The above mentioned are just a few statistics that have been possible to point out after a general look at the event itself, but, all those who, like ourselves experienced this event in person, were immediately aware of the massive flux of visitors that attended the event. Many nationalities were in evidence, drawn towards the most attractive new products and the most original proposals, in a great cultural melting pot – especially English, Chinese and Russian. In fact the Italian language, despite hosting the event, was not predominant but mixed in a great chorus of different languages, all wishing to pick up the best that the numerous tanneries and leather production tools and accessories companies had to propose. Since our business is focused on the artisan production of handbags and accessories in genuine exotic leather, we couldn’t miss this important date, highlighted in our diary. We know well that the fashion sector, with new colors every season and experimental and innovative trends is always in ferment, so it’s our pleasure (but also a duty towards our customers) to keep constantly updated in the matter of leathers and raw materials: this is why we consider Linea Pelle trade fair such an important landmark to attend. Hour after hour the number of visitors at the exhibition grew exponentially, crowding round those stands that, at first sight, were presenting the most engrossing news. Among the many leather tanneries known in the fashion world, lots of them focused their attention on exotic leather. It was impossible to ignore the superbly finished products displayed on the stands – bags, shoes and other accessories showing the real leather presented during this 3-day exhibition: and we can assure you that exotic leather is taking over a bigger and bigger slice of the whole event. Maybe it’s our natural passion for exotic leather, but we had the impression that python, ostrich and crocodile really made their presence felt in a big way: in our opinion, python leather was the lead protagonist among the products that decorated the numerous stands, deservedly indeed due to its extraordinary ability to add a touch of luxury to every item, especially when it is made by high quality Italian artisan leather companies; ostrich leather is the emblem of elegance and refinement, and it especially recurs in all those collections where we want to highlight value and quality. Obviously, alligator or crocodile items weren’t forgotten, symbol par excellence of exclusiveness and preciousness. It was impossible to remain unmoved by such wonderful artisan creations, which attracted us not only for the leather processing but also for the complete and accurate finishing and making of the item itself. We noticed that the “exotic” is winning over tanneries that generally used to treat only vegetable tanned or natural leather, which however can undergo special processes to reproduce a natural python or crocodile pattern. All this shows how exotic leather, both genuine and embossed, has become the main attraction. Sometimes these embossed leathers looked so very like genuine exotic leather that even we, though experts in the field, had to look at them very carefully to check their genuineness. However, the difference between the two kinds of leather is always visible when we’re talking about the beauty and refinement which lie in the precious visual characteristics of genuine exotic leather, and especially in its feel and weight, since python leather, as well as crocodile, when it’s well-treated, is very light. As a field in continuous growth and expansion, exotic leather has made its presence felt in all Linea Pelle editions: visitors and customers crowded so many stands trying to pick up sample pieces of leather in each color here and there, that it was often difficult for us to find a consultant free to give due attention to our requests and needs. With all this interest, let’s hope for a very good new season, both on the level of orders and turnover coming for the numerous tanneries, in particular those in Tuscany, because, as usual, it’s these that stimulate most interest in the visitors. 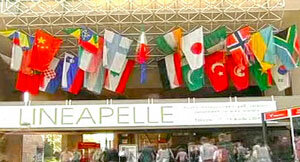 And probably, given the large attendance of visitors from around the world and a sincere interest from both exhibitors and traders, the Linea Pelle event can hope to leave everyone happy. 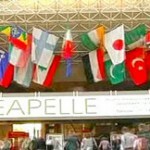 These were our first impressions after visiting the Linea Pelle trade fair that we at Gleni, certainly could not miss. As regards the updates on the color trends for the fall-winter season 2012-2013 involving exotic leather, such as crocodile, ostrich and python, and the samples in general that we chose for our future collections, we will discuss it in our next article. Follow us! 39 years old, born in San Benedetto del Tronto but living in Ripatransone since 2008, with my husband and with my beloved pets: five cats and two dogs. I love pets, and this is the reason why, after the marriage in 2008, I decided to move to the countryside and to buy a house with a big garden, far from the noises of the town. I’ve been working with Gleni for more than 12 years and I’m specialized in Cites affairs: compilation of Cites requests, contact with Cites organs, and supervision on every step concerning the shipping of goods provided with Cites documents, from the picking up here in Italy till to the delivery to the final customer. I also write about fashion trends and about Italian peculiarities and traditions. to 15 minutes are wasted just trying to figure out how to begin.